shmups.system11.org • View topic - New SLG-HD (component version) available NOW! New SLG-HD (component version) available NOW! Post subject: New SLG-HD (component version) available NOW! Only a few months after approaching Jochen with the suggestion to create a component version of his popular SLG3000, it's now already available for order (35 EUR at http://joca-tech.de/Arcadeforge/product ... ucts_id=97 ). In early 2011 the SLG3000 was a groundbreaking device. 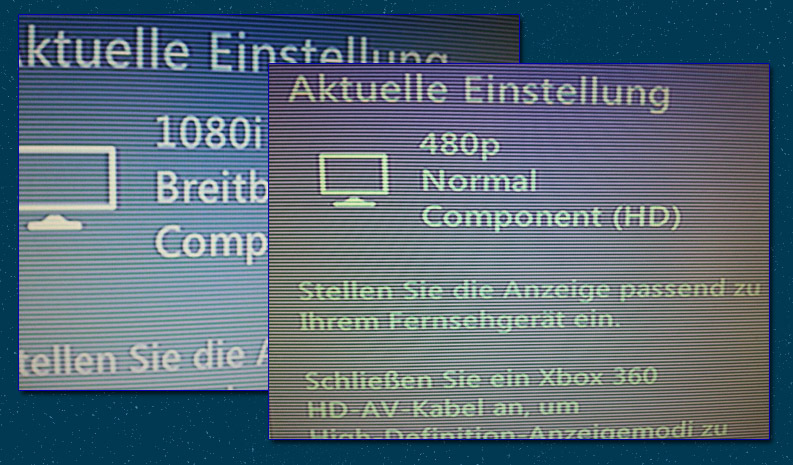 The possibility to add scanlines to any VGA signal, either directly from a console (360/DC) or to a linedoubler's VGA output, became extremely popular. Unfortunately VGA is a dying breed. Panasonic and Sony have now removed VGA inputs from their current TV sets and so did many other manufacturers. Many of the new PC displays, especially the higher-end ones with 1440p of higher also come without VGA connections these days. The new SLG-HD offers scanline emulation to any ED or HD component signal. It works great with 480p, 720p and even 1080i (with 480p and 1080i being the recommended resolutions). This means instant compatibility with PS2*, XBox, GameCube, Wii, WiiU, 360 and PS3 and almost any display. Especially interesting for our North Americans community members, the SLG-HD can be used directly on any CRT set which offers a ED or HD component input. Or course it can also be used with LCDs or Plasma sets, it can be used with upscalers (between the source and the processor), or it can be used behind a linedoubler or scaler (if it offers component output - most do). Overall the SLG-HD offers much higher flexibility compared to the VGA version (in terms of compatibitliy with different kinds of setups). THe SLG-HD offers an on/off switch, a switch for odd/even scanlines and a set of dips to chose between three different scanlines densities. My prototype still had a variable resistor (just like the SLG3000), but this caused some problems with sync stability on the higher settings, so Jochen opted for the dips instead. The highest scanline density you can achieve is about 2/3 of what the SLG3000 can do (so you can't get full 100% scanlines), but that's ok, since most people didn't use 100% scanlines anyway. The technical reason behind this is that on the SLG3000 the scanlines were "applied" to all three color channels, while on the SLG-HD the color channels remain unaltered and the scanlines are only applied to the luminance channel. The Lumimance signal can only take so much attenuation, before the TV or display won't accept it anymore (while the RGB VGA signal keeps it's full sync signal intact). Component signals are much better standarized than VGA signals (in terms of refresh rates), so it's easy to convert the SLG-HD's output to HDMI using a scaler or a mere converter. A great new addition to the SLG-family and a welcomed approach to get scanlines into setups where VGA is no option. Last edited by Fudoh on Wed Jun 12, 2013 1:44 pm, edited 3 times in total. Post subject: Re: New SLG-HD (component version) available NOW! Last edited by Fudoh on Wed Jun 12, 2013 1:43 pm, edited 1 time in total. That's more useful than I thought at first. Would work with my Cinemateq PO (which has wrong polarity for the SLG3000 on the VGA out) and together with the Lenkeng HDMI converter it would work on any modern display. The only problem I see is that component inputs might have more filtering applied. Well, and that the lag of scaler + converter + TV will probably make it unplayable. This might be a great option for the Wii though. I don't know if is from my lack of english, but after all this time here on shmups forum, i still don't know what is odd/even used in scanlines. Can someone give me a simple explanation? I've been lucky enough to get my hands on one of the prototype's and to support Fudoh's comments, it certainly get's my "scanline" approval. XBOX 360 and original XBOX work perfectly with 480p, 720p and 1080i. As an example, Deathsmiles on the 360 looks "mint". PS2 & Wii works very well (only tested 480p at the moment). The Wii image with the SLG HD is very very nice (means you don't need something like the GBS scaler, to transcode to VGA (for scanlines with the SLG 3000) for this console imo). I can't help think if this device had been available a few years back, for Wii users, Jochen would have made a killing!! YT "review" video inbound shortly! interesting, case will come too ? Post subject: Re: AW: New SLG-HD (component version) available NOW! Yes enclosure laser engraved with logo will be available roughly in two weeks. I'll offer some for self assembly as well then. What's the power supply unit for? I imagine it's because component video doesn't supply it's own power line like vga does, so it's required. Speaking of which, when I first got my SLG awhile back, I had two vga to component cables that I wanted to try hooking up, but didn't get anything because of the power issue. I know I'd have to solder a 5v onto this, but since I'm not tech savy, I'm afraid I'll fry it. I could possibly try this if I had someone to guide me. Btw, is this thing capable of supporting 240p modes? PS2 still outputs this when you run PS1 titles (plus ICO), but I'd hate to see the scanlines used improperly. The PSU is required to power the circuit, since component itself doesn't supply that requirement adequately. With the original SLG you just power externally (or use internal power from the DSUB if available), so you shouldn't need to mess around with any special requirements. With a bit of Darkstalkers at the end just for you. Will this have any effect on a component modded Neo Geo AES on a HD CRT Sony Wega? I'm not really sure what resolution that it runs at..
it will produce scanlines, but just 120 (instead of 240), so it's hardly authentic. Ahh got ya, thank you sir. What about those scart to YUV converters? Don't they upscale to 480p or just carry the signal over? looking good. i'm definitely getting one and am looking forward to what it does for the wii's component picture. i've never liked how that looked, altthough it might be better with just 480i rgb output and a proper deinterlacer, since the component output actually filters the image (i haven't tested that yet though). I've been trying to take advantage of the filtering options via component for awhile now and I must say it does look much better for picture quality then VGA ever did. That's just far too sharp for what my games really need. I know the Wii's component isn't as great as it was for Gamecube, but still that's something I hope a little calibration can fix. Wouldn't it be easier to use a software based effect suite like SweetFX on the HTPC and use a straight HDMI connection to the display instead ? I don't know if you mean using emulation in place of real hardware, but if to add shader effects then I see your point. There's something I want to see with trying this on PS3 without having to rely on a HDMI to VGA adapter like the 3000 would have required. I can't play the Simpsons without gagging, so perhaps ordering one of these will go a ways to correct it. Also I would combo this with my HD Box if it doesn't add moire patterns (considering the scaling on these things is usually inaccurate). This will work fine on a PS3. As I would expect it to. I'm already looking forward to that YT video you're working on. I was digging around with some posts on the other SLG thread and came across these pics where SGGG2 was trying to capture Dragon's Fury with his HD Fury + 3000 combo, only to be greeted by a sharp pixelated image. 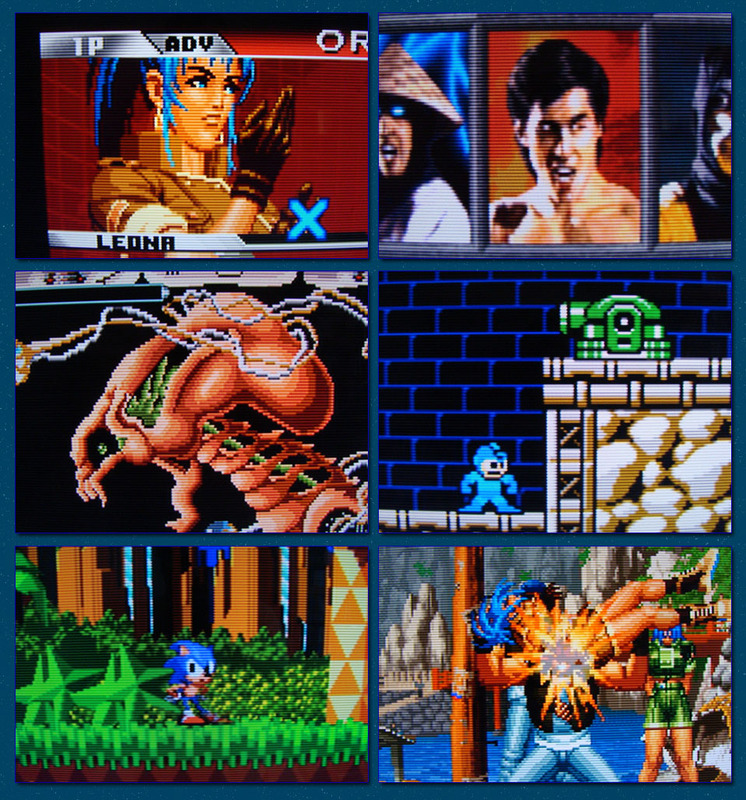 The 2nd shot showed how Xselect would properly display it, but the scaling was clearly off. He really should give this one another shot because I think this time he'll have the perfect results he was looking for in the first place. i just got mine and did some quick test runs on the ps2 and wii. the scanlines are certainly a bit weak on the ps2, but still enough to sharpen the image up and make it look less muddy. as fagin suggested the scanlines also help wii games run in 480p to look better, but it doesn't do that much. i figured the wii actually looks best when 480i is fed into a good deinterlacer (iscan vp30 in my case). it's too bad that the wii's vc and many (most? all?) low res wiiware titles won't play in 480p, so i don't see much use for the slg hd= in conjunction with a wii. That's true for PAL system menus, but on NTSC systems 95% of the VC is 480p. the scanlines are certainly a bit weak on the ps2, but still enough to sharpen the image up and make it look less muddy. Is your device on the darkest setting? Those scanlines certainly look a lot weaker than the default setting on an SLG3000.